While that youthful win earned him a coveted bag of jelly beans, his latest work has a much a farther reaching scope as it will be on display with work from artists throughout the country at the Illustration West 55 in Los Angeles in January. 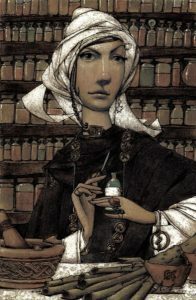 McNally’s work, entitled Lucrezia, Apothecary: Specializing in the Treatment and Cure of the Heebie-Jeebies was selected by a jury of eight judges for The Society of Illustrators of Los Angeles (SILA) and will be held at the SILA gallery beginning Jan. 6. SILA is regarded as the major professional illustration organization on the West Coast. McNally, who received the acceptance in late November, stepped out of his comfort zone to produce the work. Because he hadn’t taken advantage of the pencil’s strength, McNally, who estimates spending about 80 hours on the illustration, had to give the opacity some power. The subject matter stems from McNally’s belief that each of us has the heebie-jeebies to some extent. The term was coined in 1923 by American cartoonist Barney Google (no relationship to the search engine) and has come to mean “a state of nervous fear or anxiety.’’ His objective is to make his work a remedy for the affliction. This exhibition is merely the latest work, he has exhibited from coast to coast throughout his career, of his passion that began in childhood with that first win in second grade despite thinking that work was ruined when a classmate bumped his arm. Since, he has been happily working his craft and says much of his success is because of his family and the support his parents have given. “I think every kid has that natural inclination (to draw). You definitely have to have a certain aptitude to excel as an artist, but a big thing I’ve discovered in my own experience and in my experience as a teacher is I have a really supportive family,’’ McNally, who attended the Massachusetts College of Art and did his graduate study at the Academy of Art in San Francisco, said.